Not only the Catholics in West, the whole India are gearing up for Christmas. Festive of forgiveness, affection and merry is shortly to arrive! Santa Claus would be coming in town soon. It is not merely exchanging gifts; it’s a festive of exchanging love. People are indulged in pre-Christmas decorations with zeal and enthusiasm. India is a nation of diversity with different rituals, traditions and customs, Christmas has its own exquisite in India. We have our own way of enjoying the spirit of Christmas festive. The decorations, celebrations, gossips, smiles, and music all around make you overwhelm the winter blues and feel the warmth of Christmas. It is celebrated in various parts of India with pomp and show. For the party freaks there are lot of places for partying. The shopaholics can enjoy enormous discounts on fashion, electronics, house decor items and a lot more. Plum cakes, candies, drinks, cocktails, local feast, mouth-watering sweets, I am desperately waiting for! So are you? If you plan to celebrate your merry Christmas holidays in a merrier affair there are many places in India that are worth visiting during Christmas Eve. So why sit at home taking sip of your usual tea, provoke your festive spirit, and make your Christmas Eve special by visiting these places in India. Goa is packed with a considerable Catholics population. 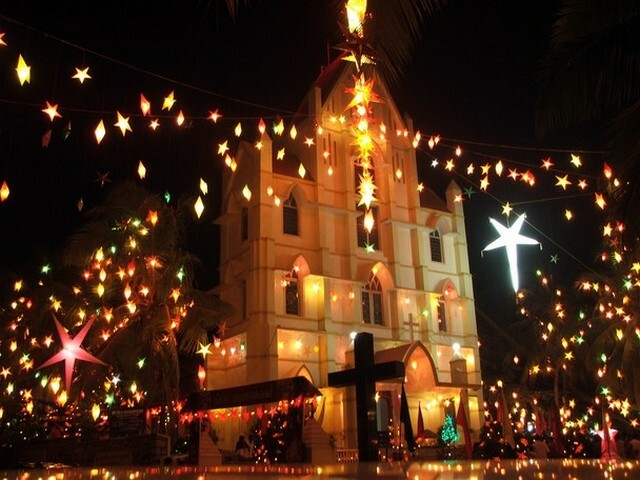 The Christmas celebration in Goa is out of the world, which offers you an experience of a lifetime! Goa is well known for its all the year merriment, but during Christmas the place becomes livelier, is decorated like a bride with artistic props. Sidewalk Christmas trees, illuminated malls, markets, cathedrals, restaurants, streets, bars and pubs make the place gleam like never before. The decorated beach shacks with live bands playing music spreads love in the air. Night long parties on beaches like Anjuna & Candolim, Mapusa are the special attractions of the place that make people flock from all around the world. The yummy plum cakes, date rolls, scent of poinsettia flowers, midnight mass in churches, and melody of carols lift up the festive mood. Puducherry is known as little France; one could experience a perfect blend of Indian and French culture in Puducherry. It also has a good Roman Catholic population who celebrates Christmas with a gala note. The Gothic churches and cathedrals are beautifully decorated during Christmas. Midnight masses and preaching remembering life of Christ by local pastors at various churches are joined by tourists, local dignitaries and common masses. Sacred heart of Jesus, Eglise de Notre Dame des Anges, church of Our Lady lourde at Villianoor and Immaculate Conception church are the special attractions of night. 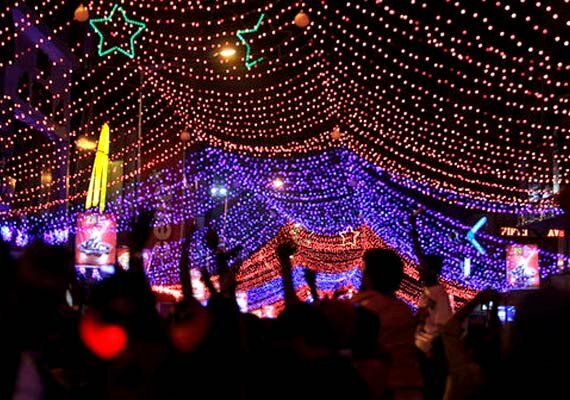 Beach night decorations and Ornamented Christmas trees on the sidewalks make Puducherry upbeat. Hang outs at the serene beaches, gossiping and bands playing songs make people rejoice the festive. You can see a lot of travelers who add to the horde of fun activities & parties. Looking at the dancing ocean waves, eating your favorite cookies while sitting with your loved ones, makes the sight more striking! Kerala owns blend of Syrian and western culture. For beach lovers, Kerala is a worthy place to rejoice the Christmas vacation in India. 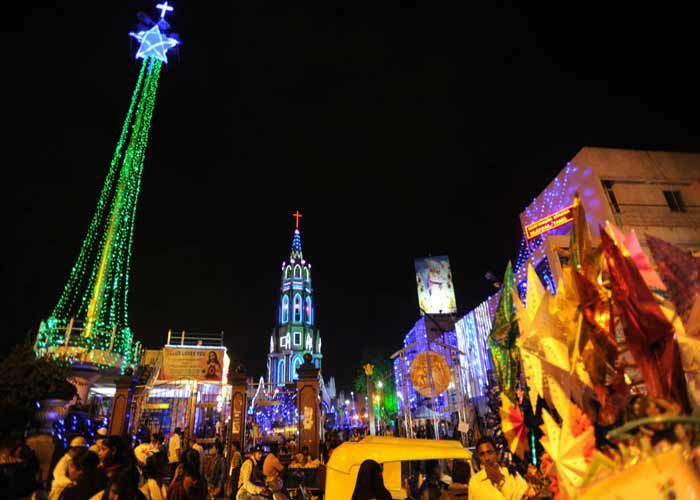 Decorated churches, cathedrals streets, illuminated restaurants, propped trees makes Kerala look like a night queen. For foodies there are variety of cookies, cakes, cocktails & drinks with heavy discounts. Exotic delicacies and Evening buffets at the blazing beaches are worth witnessing. The priests enact Lord Jesus’s birth scene, sound of mid night carols soothers the ear and boost up the mood. Kerala has various flavors for a foodie- Achappam, bread with fish molly, beef curry are the famous temptations of Kerala. Common masses exchange platters of dry fruit cakes and traditional Kerala sweets; this is a great way of spreading love and sending warm greetings. In Kochi, Trivandrum, Kovalam, Munnar, Wayanad you can enjoy beautiful surroundings, these cities are worth visiting during Christmas. Enjoy the backwaters cruise & houseboats that turn them haven tranquility. Fishing and canoeing can be an added fun. The appealing scenery, rich cultural heritage would surely revive your mood and festive spirit. Mumbai is one of the best Christmas getaways in India. The Mumbai folk possess high end spirit for festivities and fun. The zeal, enthusiasm of locals is worth seeing. Christmas trees on the sidewalks ornamented artistically, display the passion of people for the festival. Malls, markets, streets, houses sparkle in the bright lights. Church Gate, Western Suburb Bandra and Hill Road have major population of Catholics, so they are of added magnetism for the locals as well as the tourists. Bakeries have a lot to offer to you; cakes, desserts & local feast is worth giving a go. Midnight masses, jingling bells, melodious carols & hymns blow-out harmony in the environment. People attend mid night masses and lit candles in Mount Mary’s Basilica, Holy Name Cathedral, Saint Thomas’s Cathedral, Gloria Church and various other churches, with a belief that their wishes would come true. Manali is a winter paradise in India. Loves to play with snow, why not celebrate this Christmas in Manali and give it a unique sensation? Skiing, snowboarding, playing with snowballs and a lot of plethora of fun activities are there to enhance your vigor and zest for Christmas celebration. Snow roofed mounts; snowman and horde of tourists would be your right companion while waiting for Santa to come! Hang out in the lovely weather, enjoying your favorite hot chocolate at the log huts surrounded by magnificent Deodar trees. Feel the sheer warmth and compassion while sitting by the fireplace with you loved ones; the gossips and carousing brings a hilarious feel that makes the Christmas a memorable experience.